Mamba Negra from Blimburn Seeds are high quality cannabis seeds. This clear Indica strain is originated by crossing Critical Mass x Skunk. This Critical Mass which is crossed, won the Highlife Champions Cup in 2004. 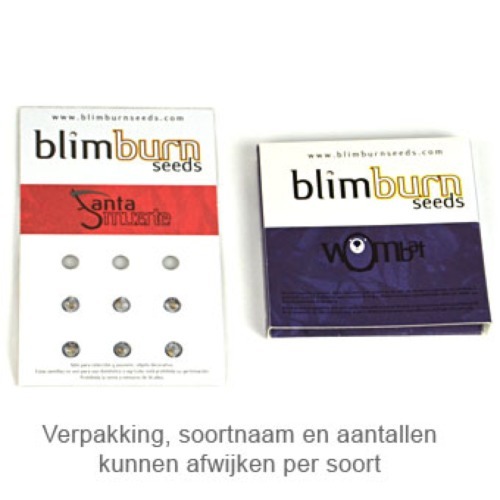 Blimburn Mamba Negra cannabis seeds are suitable for an indoor and outdoor grow. This cannabis plant has a short flowering time but generates nevertheless a high yield. Characteristic of this plant is that she grows steady with long compact buds which are highly fragrant. With an outdoor grow these cannabis seeds will grow into large plants that are mildew resistant. She is easy to cultivate but does need some care. The taste of this cannabis is very fruity and the effect of smoking this intensely fragrant Indica strain is a both physical and mental high. Ideal if you want to relax! Tell us and our customers what you think of the Mamba Negra from Blimburn Seeds.